This Saturday, 30 June 2012, the latest Lambeth Cyclists architecture ride will look at public sculpture around South London. Join us for a fascinating odyssey around Lambeth and neighbouring boroughs looking at the effect of public sculpture on the urban environment. We will visit more than 20 sites and some 40 works, including sculptures by Hepworth, Moore, Naum Gabo, Kenneth Martin, E. Bainbridge Copnall, Eric Kennington, Peter Peri and Maggi Hambling. 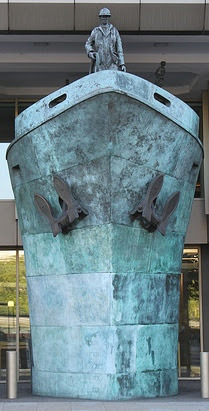 We will explore the extraordinary International Memorial to Seafarers, and tell the story of the Brown Dog Memorial in Battersea Park, a sculpture which caused riots. Everyone is welcome on this easy going ride around Lambeth and the surrounding area. Meet Saturday 30 June 2012 10:15am for 10:30 start outside the Assembly Hall at Lambeth Town Hall, Acre Lane, SW2 1RW (see map). We will finish around 4:30pm in Borough High Street.